Every year I’m the same. About this time, I say to long suffering Mr TT, “it’s so strange, I don’t feel very FESTIVE yet, you know?”. He gives me this long suffering “you’ve-already-bought-a-mountain-of-Christmas-shizz-what-are-you-talking-about?” look and carries on reading the paper. Then, I get the mixed spice and Nigella’s Christmas book out and do some baking and there, all is well with the world and the festive season is upon me. 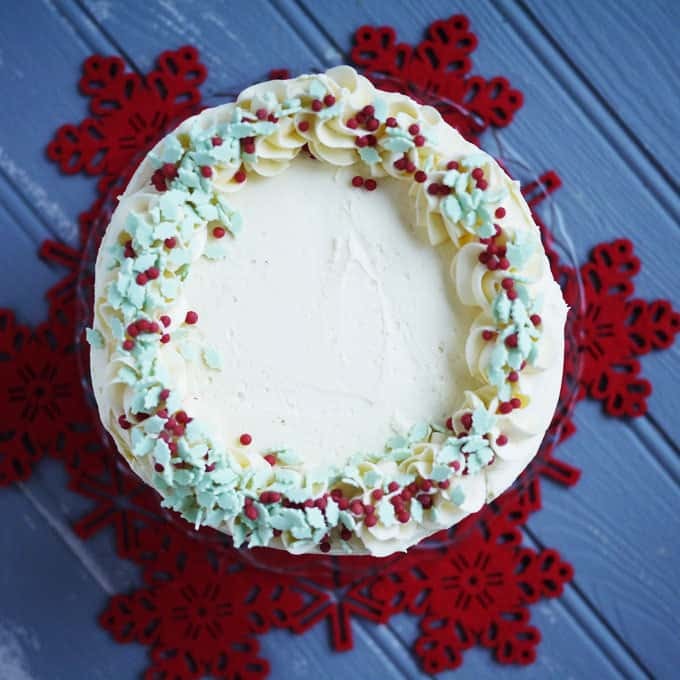 I adore festive baking, it feels like an excuse to create something for anyone and everyone. It feels like a need to bestow sugary treats upon everyone and anyone as my final good deed for the year. Oh and I love cinnamon. 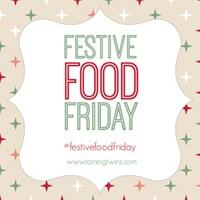 So, as I mentioned last week, I’d LOVE to share the food festivities with anyone else who loves Christmas food as much as me! You can read about my little blog linky at the bottom of this post. First things first, this here cake. You know me, I can make an excuse for a layer cake out of anything. Of course Christmas would be no different. I made this cake two years ago for the first Christmas party that my NCT group and I shared. All of our teeny weeny babies are now crazy toddlers and they would adore this cake. It’s not a rich, dark, grown up cake. It’s a light, soft sponge, not too rich. Perfect for a children’s Christmas party or an afternoon tea. 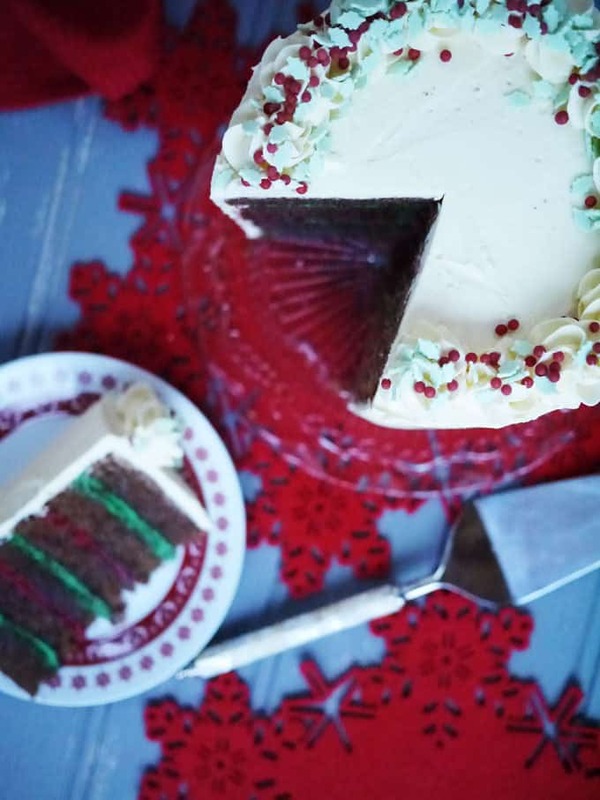 A perfect festive layer cake with spiced chocolate. Grease 3 x 7" round sandwich tins. Mix in your flour,cocoa, mixed spice and cinnamon. If you’ve been using a mixer, do this bit by hand. It helps to keep the sponge light. Beat in your icing sugar and vanilla. Beat in a teaspoon or two of boiling water to soften and lighten the texture of the icing. When your cakes are completely cold, use a carving knife to level them. Just trim the top crust off. 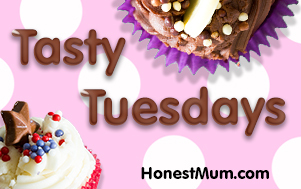 This is important, it's not a waste of cake (taste testing compulsory). If you don't do this, with a cake this size it will be wonky. Then trim each sponge in half so you end up with 6 layers. Colour 200g of buttercream red and 200g green. 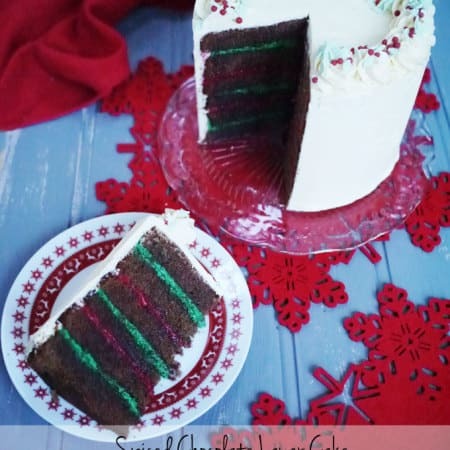 Sandwich each layer together with alternating coloured buttercream. Use the remainder of the buttercream to cover the cake and pop some swirls on top. 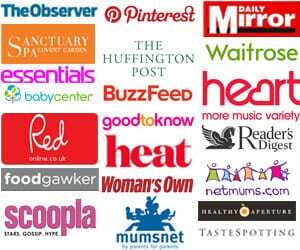 I will pin all of the posts added to my Pinterest board, which has over 50,000 followers. There we have it, hope you enjoy and I can’t wait to see what you’re all up to! Wow! Sarah another stunning cake from you, I’ve linked up with my Festive Cookies. What an amazing cake! 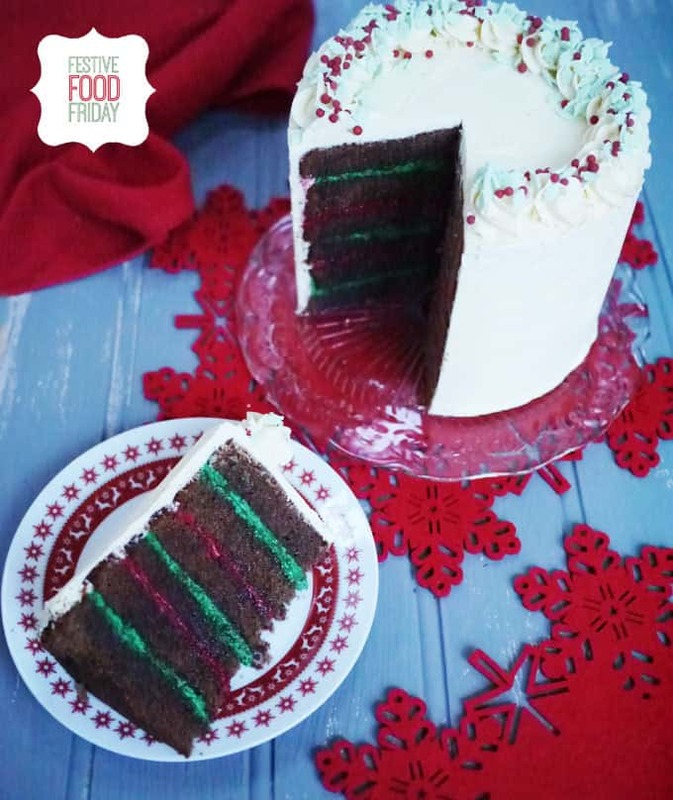 The addition of cinnamon sounds divine and I love the red and green icing layers……. so festive! 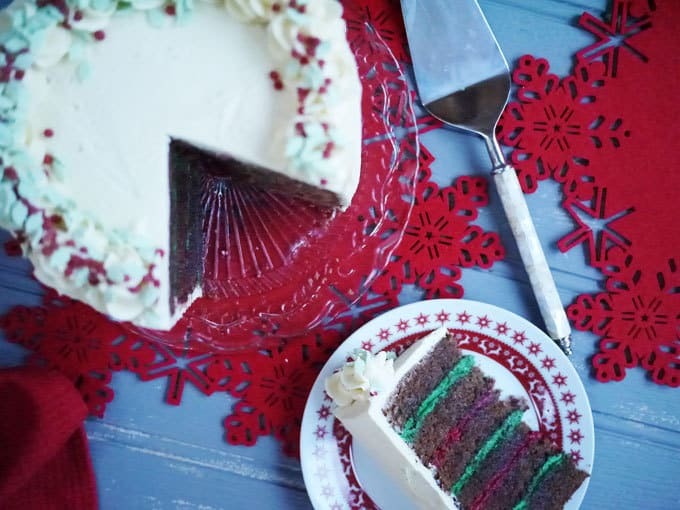 Oh wow – that looks amazingly good, especially to a reluctant baker like me! Love those cutout felt placemats too – so festive! What a fab cake, just the thing to get us all feeling festive. Will be linking up soon. I started my Christmas baking in October so it feels like Christmas is coming very slowly – I can’t believe it’s still over a month away (although that’s probably a good thing as I still need to write all of my cards). I love your cake, really beautiful and it sounds yummy. Ooo that cake looks and sounds yummy! I’m definitely in the Christmas frame of mind now! Hope to join in with your Linky soon! Such a lovely idea. I will need to put on my thinking hat and come up with a good Christmas baking idea and join up! Cake sounds delicious and very festive. I love how massive it is! Great video too – especially your apron!